About 90% of patients with this implant use it for voiding and the majority have significant decrease in infection rate and improvement in continence. UTIs dropped from 6.3 per year preoperatively to 1.2 per year postoperatively. Improvement of bladder capacity to normal and normalisation of compliance; provided that there is no serious fibrosis. Safe continence in most patients following the complete abolition of neurogenic hyperactivity provided that bladder neck function is intact. Over 90% of the patients considered have an improved QOL after implantation of the Brindley stimulator, and would recommend the system to other patients with neurogenic bladder dysfunction. Prevented deterioration of the upper urinary tract by diminution of dilatation, cessation of high pressure ureterorenal reflux and protection of kidney function. In some men, the Brindley System can also promote penile erection. Sacral rhizotomies and electrical bladder stimulation make a cost-effective method of treatment of lower urinary tract dysfunction in patients with SCI. Considerable savings on health care costs are possible in the long run with simultaneous positive effects on aspects of health status. The Brindley System can eliminate using of urethral catheters, as it can restore satisfactory continence and improve psychological as well as economical constraints related to auto/hetero catheterizations performed several times a day. The spinal cord is the major bundle of nerves that carries signals to and from the brain to the rest of the body. A spinal cord injury or an SCI is damage inflicted to the spinal cord that results in a loss of function such as mobility or feelings. Complete: There are no functions below the level of the injury; no sensation and no voluntary movement. Both sides of the body are equally affected. Incomplete: There is some functioning below the primary level of the injury. A person with an incomplete injury may have sensation below their lesion but no movement, or vice versa. Additionally, a person who suffers paralysis as a result of a spinal cord injury may be referred to as: a Paraplegic, a Quadriplegic or a Tetraplegic. The ability to control limbs after a spinal cord injury mainly depends on two factors: the neurological levels of the injury and completeness of injury. Spinal cord injuries are frequently caused by a range of events, from road accidents to sports activities. In the UK, about 1,000 people sustain a spinal cord injury each year. There are approximately 40,000 people in the UK that are thought to have spinal cord injuries. In the United States, approximately 12,000 Americans sustain a spinal cord injury (SCI) each year. Disease, such as polio, spina bifida, Friedreich’s Ataxia, etc. is also a cause of spinal cord injuries. Injuries at different points along the spinal cord cause different areas of the body to become paralysed. In theory the higher the spinal cord injury the more parts of the body are affected as the signals running down the spinal cord cannot reach its desired destination. Loss of bladder control – Bladder control after a spinal cord injury? 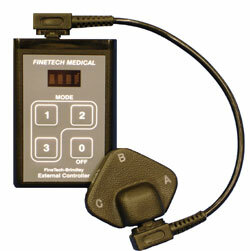 Finetech Medical produces a range of long-term implantable neuromuscular stimulators to restore function after spinal cord injury. Functional Electrical Stimulation (FES) can be used to produce contractions in paralysed muscles. Finetech Medical’s implants deliver small electrical pulses to the nerves that supply the paralysed muscles, causing them to contract. An external, wireless device is used to control the implant and its function. The Finetech Brindley Bladder Control System is named academically as Sacral Anterior Root Stimulator. It is a highly recommended treatment that helps spinal cord injury patients to restore bladder and bowel functions. Since the product was entered into the market in 1982, there are more than 3,000 patients worldwide are benefiting from it. The Finetech Brindley Bladder Control System (VOCARE) is a radio-frequency powered motor control neuroprosthesis, which consists of both implanted and external components. Finetech Medical’s implant delivers low levels of electrical stimulation to a spinal cord injured patient’s intact sacral spinal nerve roots in order to elicit functional contraction of the muscles innervated by them. An external, wireless device is used to control the implant and its function. The Implanted Components include the implanted Receiver and either Extradural or Intrathecal Electrode Assemblies. The External Components include the Controller, Transmitter Block, Transmitter Lead and Battery Charger. The system consists of two parts; the external digital controller which generates control signals and the internal receiver which is permanently implanted in the body to receive those signals. The implantable receiver block is relatively small and is usually located in the abdomen below the ribs under the skin. The user selects one of the stimulation programs. The external controller (A) then sends power and control signals to the transmitter block via the transmitter lead (B). The user holds the transmitter block (C) over the site of the implant receiver (D). The implant receiver converts the signals from the transmitter block into electrical impulses. The impulses travel via extremely flexible cables (E) to the electrodes (F). The electrodes transfer the impulses to the nerves causing the appropriate muscles to contract at the appropriate time. In people with average to heavy builds it is unnoticeable; however in slim people a very slight bump might be visible. The risk of the body rejecting the implant is extremely low (less than 1%). Current users of the system have found the device is still functioning perfectly more than 20 years after implantation. The Finetech Brindley Bladder System is a completely safe and highly reliable product. Download Finetech-Brindley Bladder Control System product leaflet. Contact us if you fit into these criteria and are interested in finding out more about this product and receiving the treatment. We will forward your details to the most appropriate spinal centre.